Offensive line coach Greg Austin isn’t one to single anyone out in his position group. For him, there haven’t been any individual stand-outs this spring, at least not that he’s sharing. Austin did offer an evaluation of the first unit after Monday’s practice. “They’ve done a good job of just jelling and understanding the scheme and the system and their technique, all those things that make a good lineman,” Austin said. That unit has been pretty much the same through spring practice — Brendan Jaimes, Trent Hixson, Cam Jurgens, Boe Wilson, Matt Farniok. That unit includes three returning starters in Jaimes, Farniok and Wilson with Jaimes having nearly two full seasons of starting experience under his belt. Even so, Austin said no one is secure in their position at this stage. That’s not the way things work at Nebraska. For the Huskers, it’s a day-by-day process of earning your spot. Replacing Jerald Foster and Tanner Farmer in the starting lineup was a priority heading into the spring, but building up the overall depth on the offensive line was important as well. On of those players that is trying to establish himself as an option as either a starter or key reserve is redshirt junior John Raridon. The 6-foot-4, 320-pound son of a former Husker has appeared in four games in his career including three last year. Heading into the spring, Raridon’s goal was to clean up some of the issues that have prevented him from seeing the field more often. Austin said Raridon isn’t quite where they want him to be just yet, but he’s made significant progress. As Austin said, position battles continue to rage throughout the spring and into the fall, right up to the season-opener. The coaches want to see the starters keep earning their job while the reserves push them from behind as they search for the best five-man group. A big part of identifying the best five-man lineup is the coaches’ increased familiarity with their players and their strengths and weaknesses. 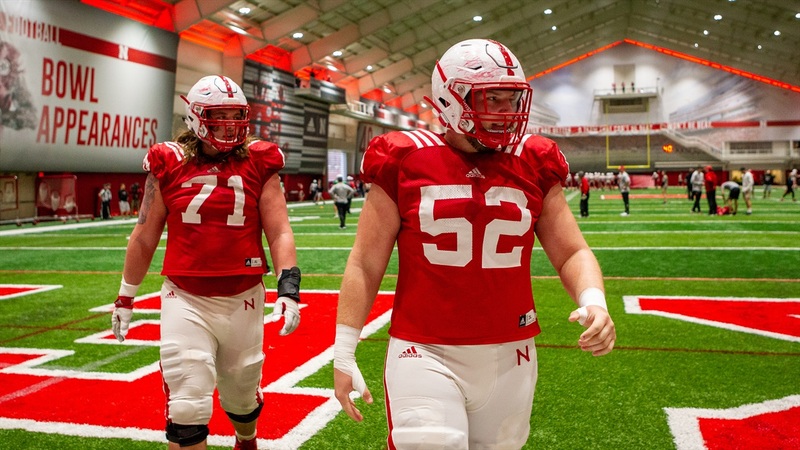 Cross-training at multiple positions is a big part of what they do, but even so they’ve made some adjustments to players’ primary positions (like Matt Sichterman moving from tackle to guard) based on how they fit in Nebraska’s current offense. Regardless of who ends up setting foot on the field for the first drive of the season, Raridon said he has a good feeling about the offensive line heading into the 2019 season.